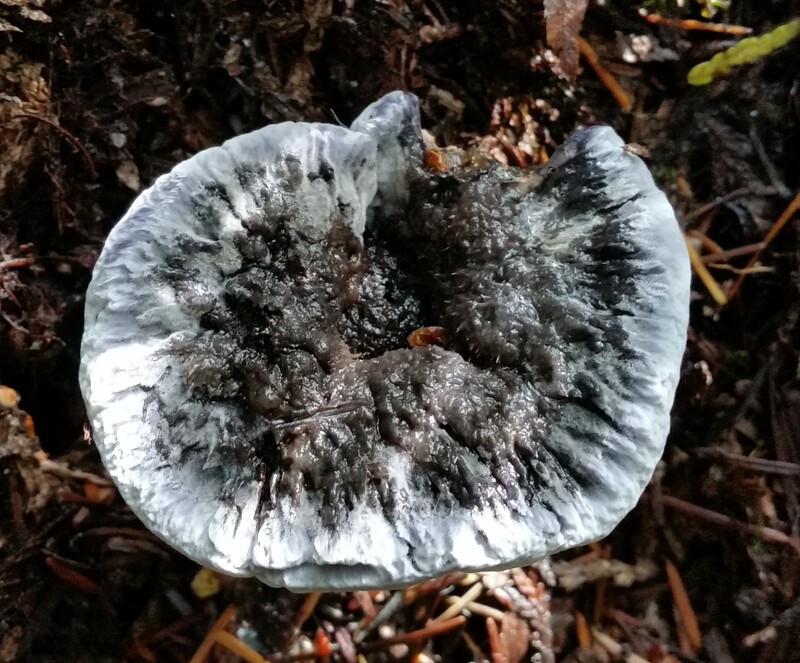 The 2018 mushroom season here on the Sunshine Coast was adequate—certainly better than last year’s—but some species were noticeably lacking, particularly Hydenellum. However, I did spot two H. caeruleum in an area where I can usually count on finding a few, and I’ve been watching them grow over the months. Today, after a few nights of light frost, it was time to bring them in. I have a few of these I saved from last year, so together they should make a fair dyepot; I’ll keep you posted. While waiting for the mushrooms . . . 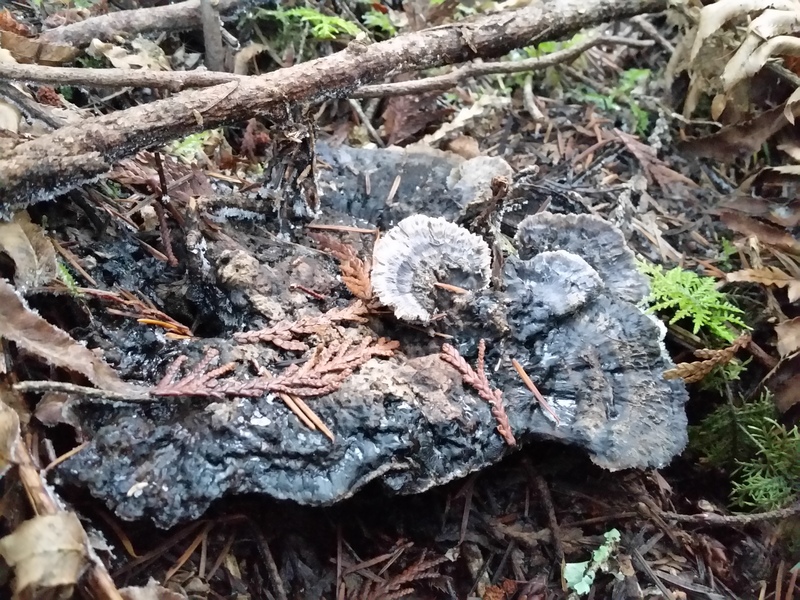 The mushrooms are late this year, thanks to another extremely dry summer when the forest floor was scarily crunchy and the community held its collective breath, aware of the devastating wildfires happening elsewhere. But the rains did come in early September, at times with a vengeance, and now I’m feeling hopeful that this could be a banner year for the dyers. 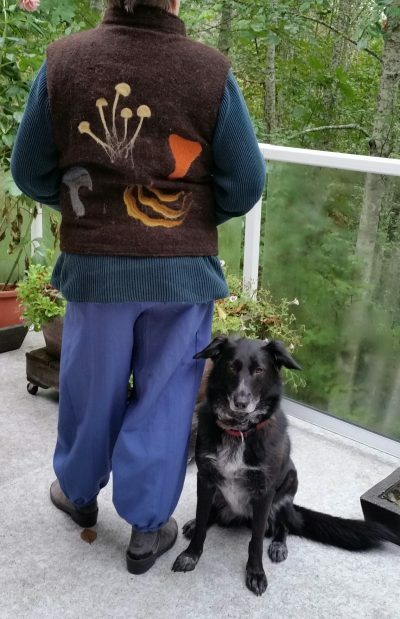 In the meantime, a friend gave me a brown vest (handspun wool, handwoven in Guatemala) around the same time that I was wondering whatever I should do with a huge bag of mushroom-dyed roving. So I put the two together, using felting needles, to tart the vest up a little in time to wear it foraying. Each mushroom is felted with the colours it gave in the dyepot. I’m not as happy with the front—I need to pull out the little bag of Cortinarius sanguineus that I’ve been hoarding so I can make those little guys red instead of pink. The other one is meant to represent Hydnellum aurantiacum (I took some liberties with the colour on this one because these little guys give a soft green while the mushroom in real life is brown with white edges), and I decided that’s the best I can do. Now I see why people get hooked on needle felting—and I’ve only scratched the surface of that huge bag of wool. 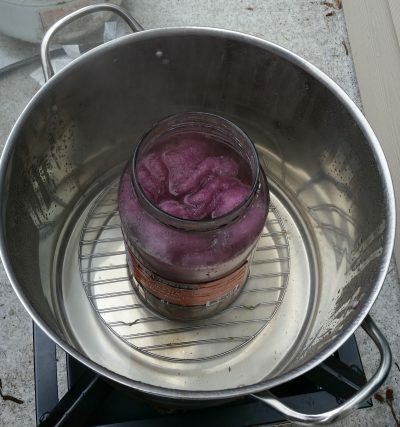 I dyed each batch by first cooking up the mushrooms in just enough water to cover (it releases its brilliant purple in just 15 or 20 minutes), then putting the dyebath and wool roving in a large glass jar and simmering that in a pot of water, effectively creating a double boiler. 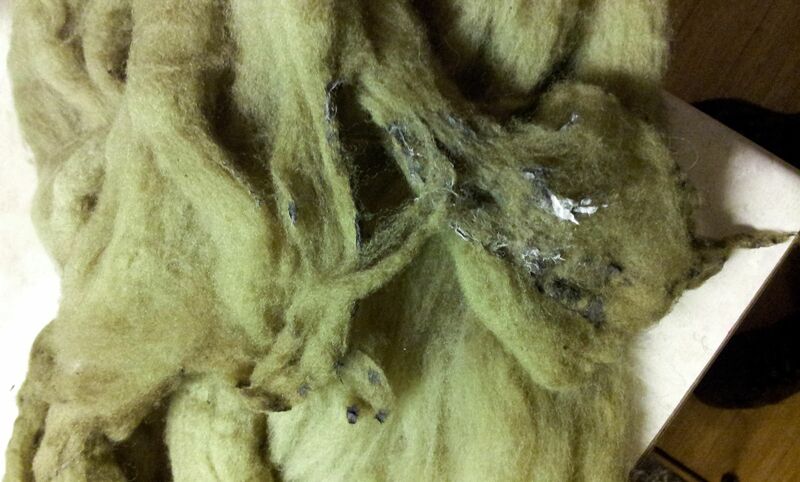 This eliminates the risk of overheating and felting the wool. I used mainly alum-mordanted wool for this, with the occasional bit of roving mordanted with iron (the steel grey yarn in the image) and copper (that’s the rich copper colour). I hope to have completed a scarf using all the colours given by these amazing little fungi in time to take to the 2018 Fungi & Fibre Symposium coming up in August in Oslo. All spots at that event were booked up in the spring— I’m so looking forward to seeing all my mushroom-dyeing friends again! To change things up a bit, I experimented with an ecoprinted silk scarf that I felt needed a bit of colour. I have to say I’m pleased with the result. The last few months have been a fallow time for me, planned and prepared for. A dear friend needed some space to be alone for a while, and I needed a push to get my studio space organized. The cottage where I do my dyeing and other stuff started out as a B&B (dog-friendly), so it was already set up for someone to stay there comfortably. I started by packing up all the wool I’d accumulated over the years, and I was embarrassed to find that I had so much. So I adopted the mantra we use when looking through our closets: If I haven’t touched it in two years, it’s time for it to go. The timing was perfect, as my wonderful fibre group (Sunshine Cost Spinners and Weavers) has an annual Stash Day every January, when people bring things they no longer want or need. This is how I obtained much of my fibre when I was starting out. 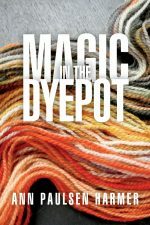 I had so many bits and pieces of things I no longer wanted – for example, I had lovely wicker baskets throughout my space, filled with skeins of handspun, silk scarves, and wool waiting to be dealt with. The problem was, all of this had been sitting in baskets for too long and was starting to look tired, in my eyes anyway. Everything has now gone to good homes. I packed away most of my dyeing supplies, and found I still had many little brown bags containing dye mushrooms, some from as long ago as 2014. I will use these over the next few months because I want to go into the 2018 mushroom season with a clean slate. In the meantime, I have a confession to make. First, I must explain that at the International Fungi & Fibre Symposium (wonderful people, all), we keep the focus on mushroom colours because we are the only group anywhere that is dedicated to this pursuit. 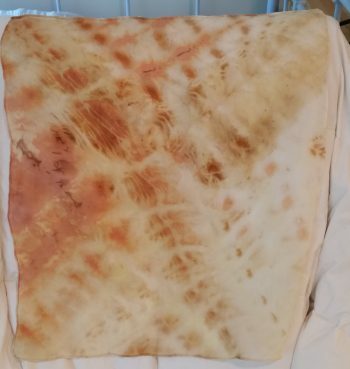 So it’s with some trepidation that I have to reveal this: I have been flirting with botanical printing, rusting, and – most exciting – making kombucha scoby into clothing (more to follow). And . . . I’m combining these fibre treatments with mushroom colours. I’m no longer a purist, but the lack of mushrooms in 2017 has forced me to look at other ways of using what Nature gives us, and it’s all good. Rest assured that anything I take for display at the next Symposium will have mushroom colours and no others. 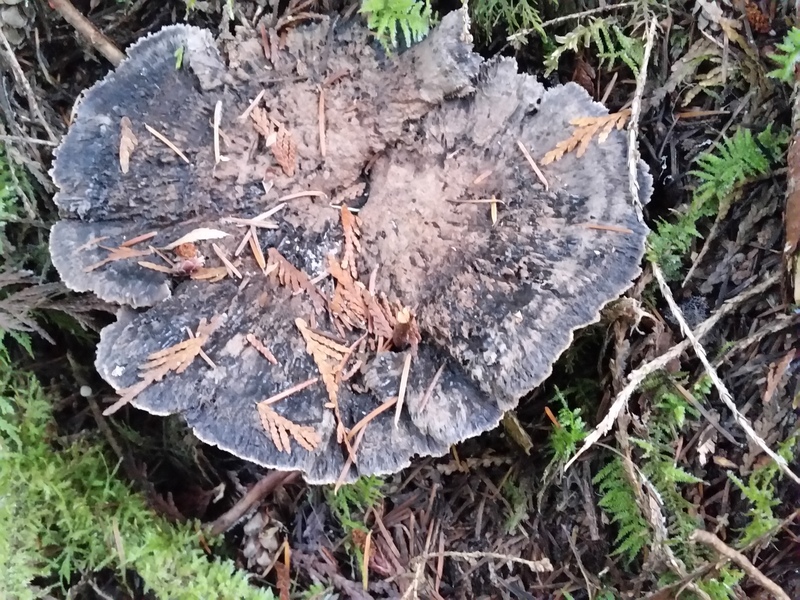 But here’s how I justify these pursuits: everything we do relies on the presence of fungi in some capacity. 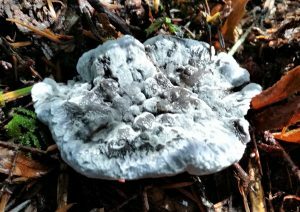 The botanicals I use in eco-printing rely upon the fungi that work in our soils. There must be some role for fungi in the rusting process, and I know fungi play an important role in the production of kombucha. (Scoby stands for Symbiotic Combination Of Bacteria and Yeast—yeast belongs to the kingdom of fungi.) So I might be expanding my area of creative play, but in no way am I eliminating mushroom colours. 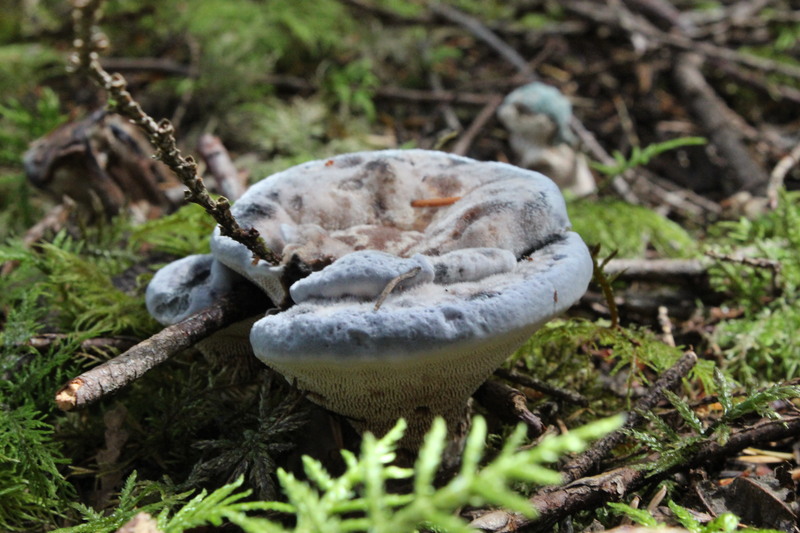 I am so looking forward to Norway in August, and I can’t wait for what I believe will be a memorable mushroom season. 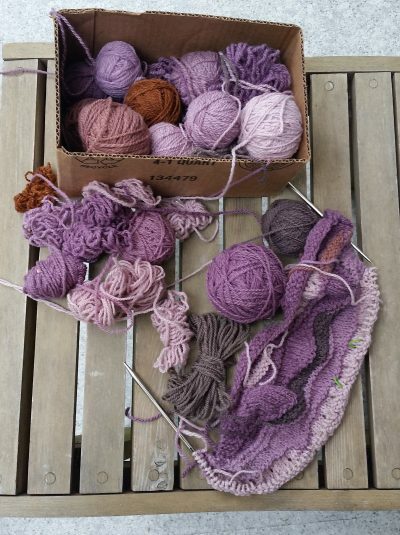 One consequence of The Big Clean was the realization that I had way too much handspun yarn. I had to find a way to deal with this, and here’s the result. Wrap knitted from leftover mushroom-dyed handspun. This garment—l’enveloppe, designed by Sally Melville and available on Ravelry— has to be seen at several different angles to understand its construction. The pattern was for a much smaller shrug in finer wool, but I decided to use a different handspun for each row (with the occasional row of silk cord tossed in) and just follow the instructions, knowing the final garment would be much larger than the pattern had intended. It’s turned out to be very warm on these cool spring days (you’ll see that the tulips haven’t opened yet)—but I still have bags of leftover handspun to deal with! The mushrooms on the Sunshine Coast decided that 2017 would be a fallow year, a time for them to take a complete rest, gearing up to return next year in amazing abundance. At least that’s what I’ve been telling myself. 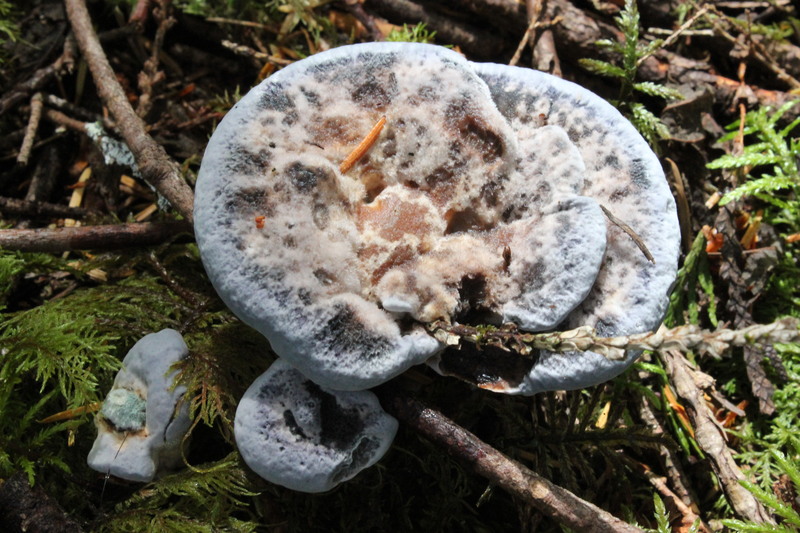 A number of dyers didn’t even show themselves this year, at least not in my usual patches, including Dermocybes, Sarcodon fuscoindicus, Hydnellum aurantiacum and H. peckii, and Hypomyces lactifluorum. So I’m carefully using up most of last year’s stash while thinking of other ways I can make use of the few mushrooms I still have (as in eco-printing and, if I can figure out a way to make it happen, with kombucha—but more of that later). All of this to say that I haven’t been in my studio lately as much as I’d like. From the evidence I found this week when I lifted the lid off what I thought was an empty dyepot sitting on my outside workbench . . .
. . . I’ve been away far too long! I went back to my notes and discovered I’d processed this Phaeolus pot with iron-mordanted roving over a month ago, and clearly a fungus of a different sort found the wool attractive, at least the parts exposed to air. 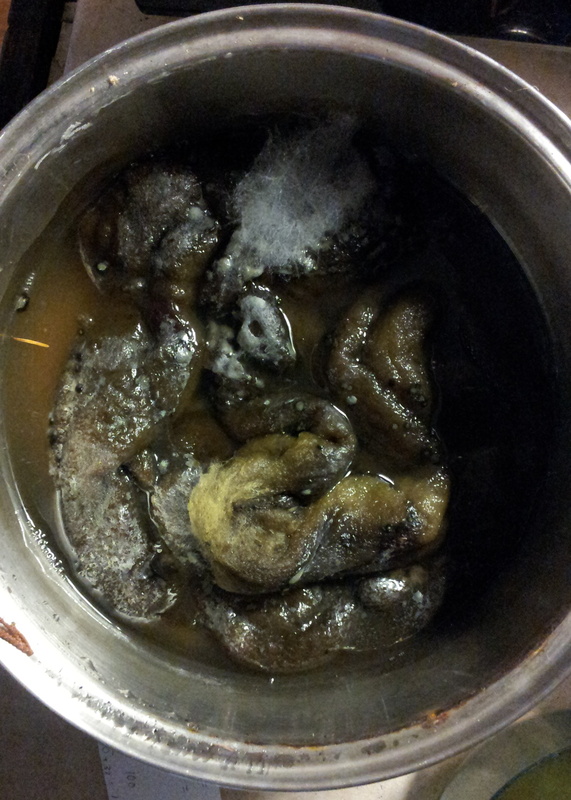 I pulled the fibre out and found little black bits where the mould had found good resting spots. 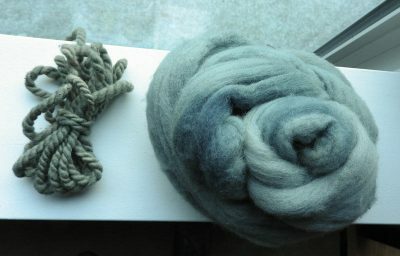 I’m hoping to get a good supply of this lovely green, enough for a large spinning project, so I couldn’t bear to see this wool go to waste. As it turned out, after I washed the roving and pulled off the black bits, there seems to be no harm done. I’m glad this is a forgiving medium.